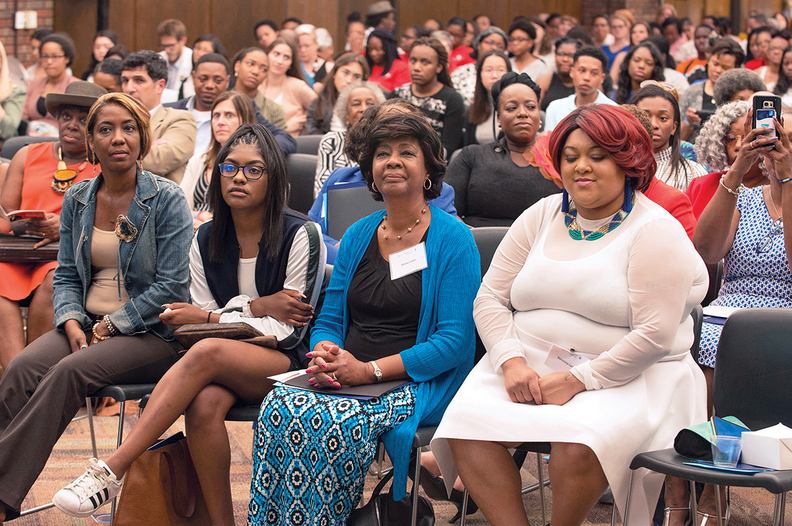 At right, Veronica (Henrietta Lacks' great-granddaughter) was among the family members who spoke at the University of Illinois at Chicago about Lacks' legacy in medical research. The name Henrietta Lacks was never mentioned around Veronica Robinson's household when she was growing up in Baltimore. Robinson, the great-granddaughter of Lacks, said the name of the now-famous cell donor brought up too many painful memories for her family. "My grandfather had to watch his mom die an excruciating death," Robinson said. Lacks underwent treatment for cervical cancer in 1951 at Johns Hopkins Hospital and died the same year from the disease. But unbeknown to Lacks or her family at the time, samples of her cervix were taken for medical research. Her cells became known as the HeLa immortal cell line, the most commonly used human cell line for biomedical research and arguably the foundation of every medical science discovery made over the past five decades. "She just impacted the world in such a grand way, and most people still don't know who she is and why she's important," Robinson said. Medical researchers are rethinking how patients are recruited for studies in part to overcome distrust of the medical community among some populations that dates back decades. But the contribution Lacks made to medicine was largely unknown for years. Her own family was not informed of the HeLa line until the 1970s and have never been compensated for the cells that have been used for everything from cancer and AIDS research to gene mapping. The way Lacks was treated is one of many examples of experimentation that has led to exploitation, injury and even death, which together are at the root of decades of mistrust of medical science among certain communities. "All sorts of ethical research violations as well as the prevalence of health disparities that we have going on in this country give underserved and marginalized communities some sincere pause for trusting and working with medical researchers," said Teri Browne, an assistant professor at the University of South Carolina's College of Social Work. Recent changes to the Common Rule, the federal law protecting human research subjects, upset patient advocates who worried the first update to the law since it was written in 1991 would threaten patient privacy and allow for biospecimens to be used without patient consent. But the relationship between patients and researcher may finally be changing, as the advent of precision medicine is altering the way in which clinical trials are conducted, with treatments being tailored more toward a patient's genetic makeup rather than the type of disease they have. "The standard cancer trial was you took patients with a certain type of cancer and randomized them into treatment A versus treatment B and looked at the effects on survival and other outcomes," said Dr. Sundeep Khosla, a Mayo Clinic endocrinologist and clinical researcher. "With precision medicine and the ability to sequence the tumors, you might have patients with lung, ovarian or breast cancer all part of a trial because they happen to have a common mutation that happens to be targeted by a particular drug." That approach requires a collection of patient personal data on a scale that has never been seen before, which could mean that getting complete data sets within those disenfranchised groups could be difficult, given their past. "Medical researchers in our country have a pretty bad history of research ethics when it comes to vulnerable and underserved communities," Browne said. Perhaps the most egregious example occurred from 1932 to 1972 through the U.S. Public Health Service. Known as the Tuskegee syphilis experiment, researchers observed the progression of syphilis in 600 poor, African-American farmers in Alabama without ever telling them they were infected with the disease, or providing them with treatment despite the availability of penicillin as early as 1947. The movement to broaden the pool of patients in clinical trials was bolstered by the creation of the Patient-Centered Outcomes Research Institute in 2010 under the Affordable Care Act. PCORI's mission to investigate the relative outcomes and effectiveness of various medical treatments has pushed researchers to design more patient-centered medical research studies and look upon patients as collaborators. Sometimes, researchers asked for patients' help with the design of the studies themselves. "It's very different from the very paternalistic type of model we had with research," said Dr. W.H. Wilson Tang, a cardiologist at the Cleveland Clinic and director of its Center for Clinical Genomics. "I think there's a growing emphasis on making sure that the research that we do matters," Browne said. "And it's hard to do that and connect our results with actually improving people's lives without making sure that the research that we do is patient-centered." Browne cited her own work as evidence of the increasing role patients play in clinical research. Browne is part of a five-year, PCORI-funded study that began in 2016 in partnership with researchers from Duke University and Geisinger Health System to examine how to improve quality of care and health outcomes in kidney disease patients as they transition from early stages to end-stage renal failure. Eight patients and their families have worked as partners with the research team since the beginning of the project. They have helped form research questions from a patient's perspective and have been involved in the writing of the grant application for federal funding. "They are true co-investigators," Browne said. "They add so much to making sure that this research project is really going to help patients." Many in those communities can either directly or indirectly tie their reluctance toward participating in medical research to past cases of exploitation like those of Lacks or Tuskegee. "I think when it comes to our communities, our very, very young people may not exactly know Henrietta Lacks or Tuskegee, but they have inherited, unfortunately, a mistrust of the health system," said Dr. Robert Winn, associate vice chancellor for community-based practice and director of the University of Illinois Hospital & Health Sciences System Cancer Center in Chicago. In 2015, UI Health along with Northwestern Medicine and University of Chicago Medicine partnered to apply for a grant to be part of the National Institutes of Health-sponsored All of Us Research Program. The program aims to collect health information from 1 million volunteers, with the goal of gathering data from such a large scope of the population that it enables research on a variety of diseases and provides more individualized treatment approaches. The NIH is expected to fund up to $5 million in grants over the next three years to support community-led outreach initiatives such as the one at UI Health. "The standard of care doesn't always mean that people get the appropriate care," Winn said. With the move toward precision medicine, Winn expressed concern that populations that don't participate in medical research could miss out on the opportunities to find better treatments that are more personalized. According to the NIH, more than 1,000 people have enrolled in the All of Us program in the past two months. For their part, the Lacks family understands how distrust for the health system can lead some toward avoiding participation in medical research. But Robinson said the family uses its own experiences not to discourage others from participating in studies, but rather to create a dialogue between the medical and patient communities. "We are the family of research and medicine," said Veronica Robinson, who is currently training to become a registered nurse. "Our role in the community is to help bridge that gap between science research and medicine." Last month, Robinson along with members of her family attended a forum in Chicago held by UI Health in which the subject of establishing public trust in research was discussed. She said trust starts with patients asking questions and researchers taking the time to listen and address patient concerns. "If the community is afraid to answer questions and share things about themselves, how can they be cared for better?" Robinson said. "But researchers have to remember when they talk to people they have to talk to them in ways they understand, because if they don't they're stealing something from them."